Please call the parish office to plan the Baptism of your child and register for the required preparation class. Baptisms are celebrated in community with other parishioners during weekend liturgies at St. Joseph Parish. Parents have the option of having their children immersed or water poured upon the head during the baptism. 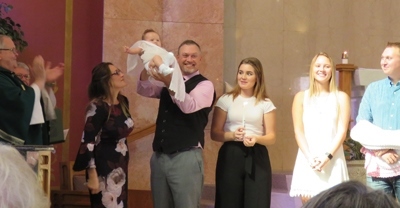 Baptisms celebrated outside of Mass are held on the first and third Sunday of the month after 11 a.m. Mass at approximately 12:30 p.m. In order to have a child baptized at St. Joseph Parish, parents are required to be members of our community of faith. Click here here to become a member of the parish. If this is the first child being baptized, parents must attend a baptism preparation class. Sessions are held at 7 p.m. on the fourth Thursday of the month in the parish rectory meeting room. Registration, which is required, can be done by calling the parish office, 815-939-3573. Parents may have two godparents—one male and one female—for their child. They need at least one fully initiated Catholic as a godparent. One fully initiated Catholic is acceptable if a second is unavailable. *Special arrangements can certainly be made to baptize toddlers and older children. For details, call the parish office, 815-939-3573. Adults interested in baptism or learning more about becoming Catholic are invited to consider taking part in St. Joseph Parish’s Rite of Christian Initiation of Adults process. For information, contact the parish office.